Science outreach can be many things—teaching and inspiring a younger generation of scientists, communicating results in an accessible way to the public, or engaging in public advocacy for things like increased government science funding or the adoption of evidence-based government policies. These activities are becoming more and more crucial today as they build a foundation of trust between the general public and scientists. This trust is not only essential to keep publicly funded science in the national interest, but it is also our responsibility as scientists to give back to the communities that support us. To this end, COMPASS holds a grant competition to fund ASCB members engaged in outreach activities within their local communities. Preference is given to grant projects in underserved communities. See highlights below of funded projects from our recent fall 2017 grant cycle. Do you have an idea for an outreach activity within your local community? The next grant deadline is January 12, 2018! 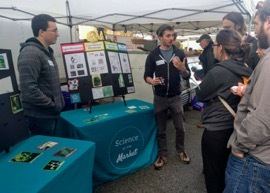 Science at the Market – Graduate students and postdocs from the Institute for Protein Design at the University of Washington have combined their passion for science and the local farmers market. 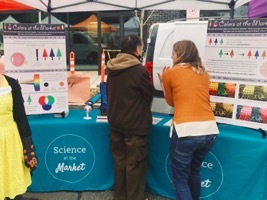 They hold a recurring booth at the University District Farmers Market in Seattle with public-friendly posters and props, with the goal of communicating a range of scientific topics in easy-going conversations with the public. They have expanded their group to include experts on clean energy and atmospheric science from UW and plan to expand to other farmers markets in the area. This provides an informal setting for scientists to practice communicating with the public, as well as for the public to ask questions and get answers on interesting and relevant scientific topics. If you want to know more about them, follow them on @SciMarketUW on Twitter. Ask a Scientist Night – This event is held for 6-12th grade students in the Irvine Unified School District in California. Graduate students from UCI Center for Complex Biological Systems participate in many outreach activities, including nights in the community with short presentations geared toward students and their parents about their daily lab work. This helps the students connect with scientists working on issues that benefit them. The group also held an essay competition for students on ways to address a scientific question and promote the scientific method to students. 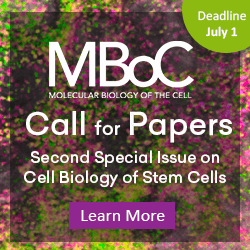 Present Your PhD Research to a 12-Year-Old – This long-standing program at the University of Texas at Austin provides an excellent opportunity for graduate students to cultivate their communication and outreach skills on a younger audience. Graduate students present their thesis research to local middle and high school students, who in turn score the graduate students on a rubric for marks in clarity and accessibility. The middle school and high school students then must team up and relay what they learned from the presentation for prizes. How well the younger students perform in relaying the information reflects on how well the graduate student was able to communicate their science. Science and Art in Puerto Rico – Graduate students and postdocs from the Biomedical Sciences PhD program at Ponce Health Sciences University in Puerto Rico have organized an outreach activity for underserved high school students in rural southern Puerto Rico. The 9th-12th grade students were responsible for presenting on how mosquitoes transmit disease after creating mosquito art sculptures and rotating through stations presented by graduate students/postdocs at their school. The graduate students and postdocs presented information on neural diseases using preserved specimens and microscopy demonstrations. The students also had to give their presentation in English, giving them a chance to practice another skill set. This coordination between the high school art, science, and English curriculum gave the students a unique opportunity to translate a range of things they have learned in the classroom into an interesting presentation about an important public health topic. This will hopefully spark a long-term interest in science and give the high school students an idea of what a career in STEM could be. Wisconsin Science Festival – Under the umbrella of the Wisconsin Science Festival, COMPASS was able to fund graduate students from the Neuroscience Training Program at the University of Wisconsin-Madison traveling to a rural Wisconsin high school to teach them about neuroscience and brain development. 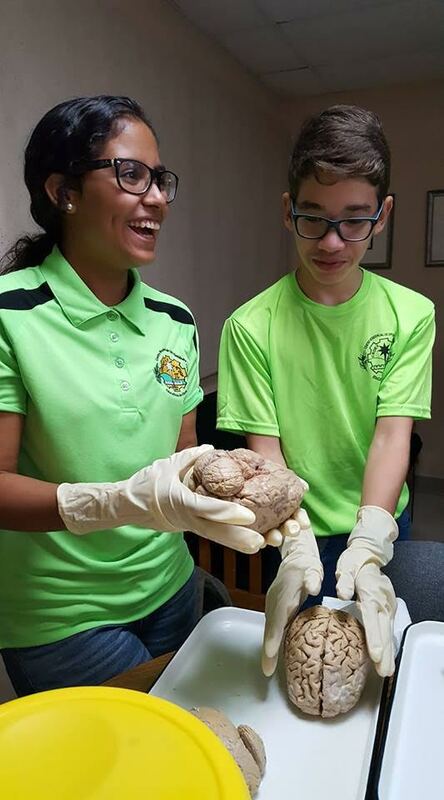 Students were given a chance to hold a human brain and dissect sheep brains in small groups as guided by the visiting graduate students. Graduate students also gave short presentations to the students on their thesis work. This exciting hands-on opportunity benefits both groups involved. Graduate students obtain experience teaching a lab-type activity and communicating their own research on neuroscience to a more general audience, and the high school students get their hands on a brain, hopefully sparking a lifelong interest in neurobiology. 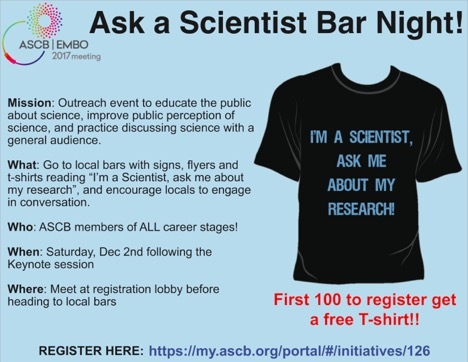 ASCB Ask a Scientist Bar Night – Do these projects excite you? Do you now NEED to get involved in communicating your science to the public? Good news! At the ASCB/EMBO Meeting, you can try out your new taste for outreach at the Ask a Scientist Bar Night. ASCB members will be flooding local Philadelphia bars with T-shirts and signs reading, “I’m a scientist. Ask me about my research.” The goal is to be visible in the community and available for genuine and casual conversations about science. Come join us at 8:30 pm near registration following the keynote talk Saturday night!